I just returned from NY. While there, my friend, Jane treated me to an angel card reading with Lisa K . The message Lisa conveyed was about “flow”. 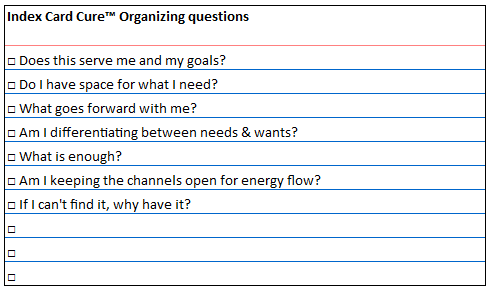 In a very busy life, abundantly filled with a myriad of good ideas, goals and intentions, how do I allow energy to flow? Or, looked at from the other side of the coin: what prohibits flow? There’s a physical component to this. Where is clutter that needs releasing? The abundance we have access to can create blockages. How many times have you known that you own a tool needed for a project, but you aren’t sure where to find it? You search or buy another, frustrated by either choice. What purpose does it serve to have a stockpile of paper products, if it becomes a fire hazard? How convenient is having a jumbo jar of salsa that goes bad before getting used? I believe in the environmental mantra of reduce, reuse, recycle. If food in the frig turns into a science project, evaluate your meal preparation system. Even if you compost the moldy chili, there is still waste involved–soil is fed rather than people. Weekly menu planning based on inventory and scheduled commitments goes a long way to simplifying shopping, meal prep and limiting waste. The second aspect of flow is mental. 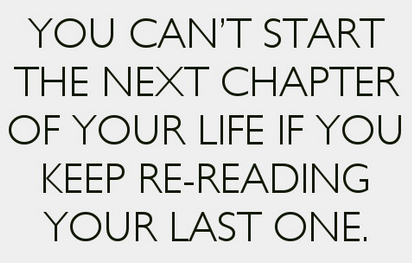 On my visit, I noticed a sign, “You can’t start the next chapter of your life if you keep re-reading the last one.” Sometimes, we need to clear the decks, whether commitments or clutter, in order to launch our next phase. What baggage are you hauling around? What is bogging you down? Be conscious of dragging old stuff into your new life. Let go, let God. And the universe will provide.